This reading is in contrast to the reading for archetype 42. This reading describes people making offerings to God. In the next reading, God makes an offering to people. This reading is best understood metaphorically. Obviously Jesus is not looking over the shoulder of those who are donating to God’s temple. The widow represents every person who lovingly gives everything they have to God. Jesus is telling us to hold nothing back from God because God holds nothing back from us. In surrendering everything, we are given the opportunity to be all that we can be. 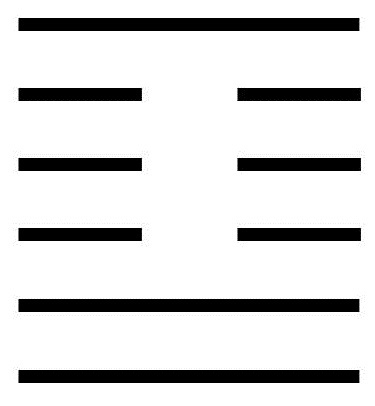 This hexagram consists of the trigrams Stillness on top and Wonder on the bottom. These two trigrams have upper lines that seem out of place. The lower trigram is missing a strong solid line to complete its set, and the upper trigram is missing a weak broken line to complete its set. It seems that the missing strong line in the bottom trigram has been given to the upper trigram, which has exchanged it for a weak line. For the lower to sacrifice to the higher. A moving line in the bottom position suggests that it is good to help others once one’s own responsibilities have been fulfilled. But the one helped is also responsible for not devouring so many resources that the helper is left weak and vulnerable. A moving line in the second position warns the helper to maintain self-awareness, to remain composed, and to stay dignified. Sacrificing self to serve others is like stealing from the foundation to strengthen the facade. A moving line in the third position warns that three is an unstable number of people. Two will form a bond, and the third will be jealous. One is also unstable. A single person needs companionship. Thus this moving line suggests two is the ideal number for the team, and that this will soon happen. A moving line in the fourth position suggests that the reason people are not helping is because of faults. This is not the time to question others as to why they are unwilling to help. This is the time to look inward and ask yourself what you are doing to make others not want to help. Such introspection is not easy, but it is necessary. A moving line in the fifth position brings good news. The signs are favorable. Your path is blessed by God. A moving line in the top position describes one who brings blessings to the whole world. Any power this person attracts is immediately used for the benefit of all. In this situation, power is not a zero-sum game. One can gain without others losing. This is a path to success that is blessed.